We sincerely wish you all a Happy New Year 2018 and hope that we see each other at one or another event this year! You have the opportunity to see us live on January 12th, 2018 at the aaltra in Chemnitz - there we play as Copeya ! On Saturday we are at the 1. 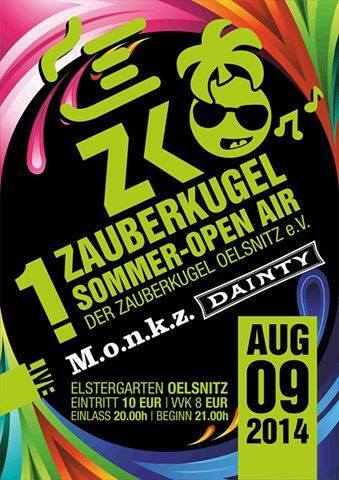 Zauberkugel Open Air in Oelsnitz together with our friends of the band M.o.n.k.z., in which Leo plays the bass. The newspaper "Vogtlandanzeiger" did a nice article about the event which you can find HERE. If you have some song wishes for this night, you can post them on our Facebook profile! 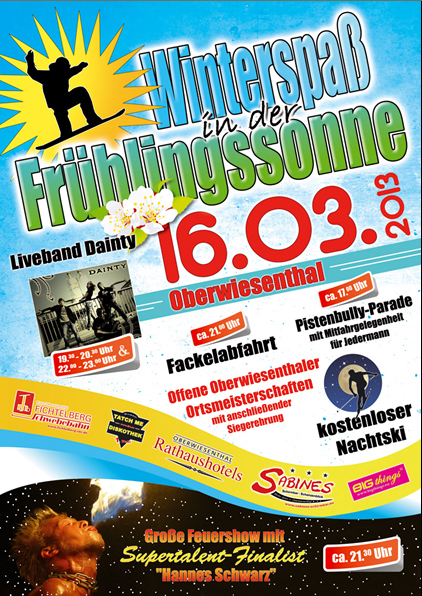 See you on Saturday in Oelsnitz! We are part of the first edition of the lifestyle magazine viadukt with our project Copeya. The article is part of the series "Vogtländer in der Welt" and is mainly about our last US tour with Copeya. We think that the article is very nicely written and give a big "thank you" to viadukt. Everyone who is not able to get one copy in your Sparkasse of trust, can read the article online on the Copeya Homepage www.copeya.com. Enjoy reading! Today the series >> SPECIAL DAYS IN DAINTY HISTORY << starts in which we want to remember special events in the past 12 years of band history during the upcoming months this year. This will mainly take place on our facebook profile, where we also encourage you to share your special DAINTY moment with us. We will be back live on stage from May on, since Lilli is visiting the US again til then. 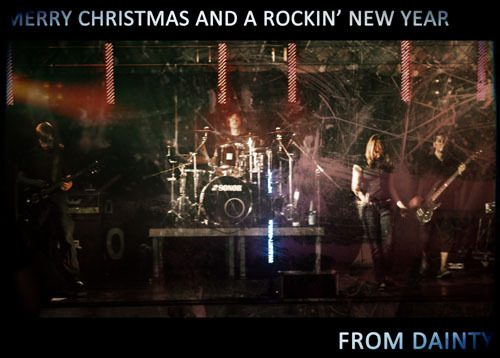 We'll keep you updated on the new live dates for 2014! 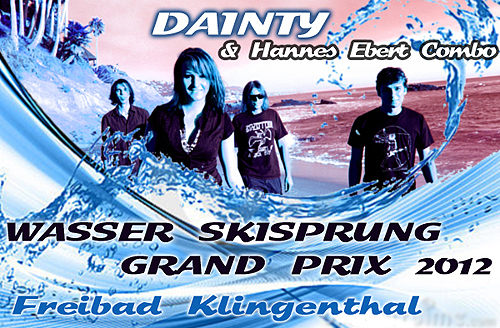 Our first SPECIAL DAY IN DAINTY HISTORY is today because exactly 10 years ago DAINTY played at the Vogtland Rock Event for the first time. The lineup at that time was Lilli (voc), Leo (dr), Henning (git), Tino (bg) und Benjamin (keys). Greetings from your four DAINTYs! If you are wondering why it has become so quiet lately around DAINTY and our own music - we have a new project called Copeya, to which we devote our full attention. Under this name we already released the first single and are about to tour the US again from August 21st on. If you want to know more about it, visit www.copeya.com or like us on Facebook. We hope you like our new stuff as much as we do! And don't worry... DAINTY will still exist. So see you soon! Unfortunately, we have to inform you that the motorcycle meeting in Audigast this weekend is canceled due to the flood. The entire terrain is / was under water. We hope the best for the Elsterauer biker club and the flood victims and wish strength and endurance !!! From yesterday's Flowerpower spirit to the ski run at Oberwiesenthal! In September you can see us live more often - in cozy clubs and at festivals. Come around and join us! We would be happy! 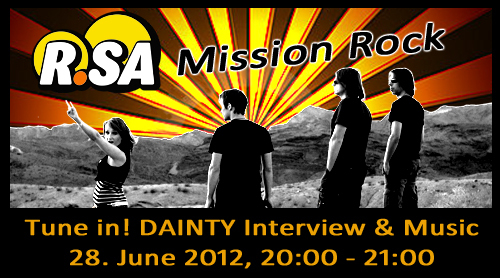 Thanks to Neumi, we are happy to announce that the radio station R.SA will broadcast one hour of our music and an interview tomorrow. 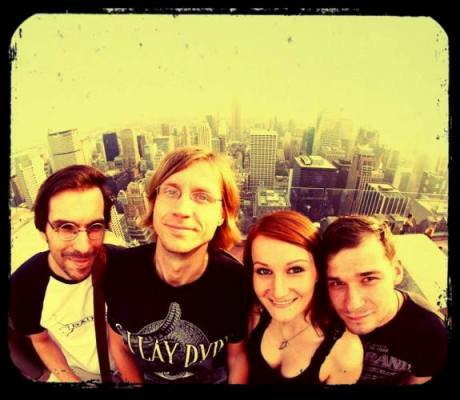 The show Neumis Rockzirkus will present us under their Mission Rock ...how great is that!!! So tune in at 8 p.m. For all of you who can't receive it there will also be a stream later. We are so excited!! The NENA Support concert was great, although a little bit chaotic. We are full of love and new impressions and experience. It was nice, but far too short! Thanks to all for filming, blow-drying, photographing, merchandising, singing, partying and clapping with and for us! Special thanks to KLEE for the technical support. More pictures of the exciting evening >>here<<. We're happy to announce that we have won the contest for the opening act of NENA! That is why we're going to support one of the most successful German solo artists on April, 29th! 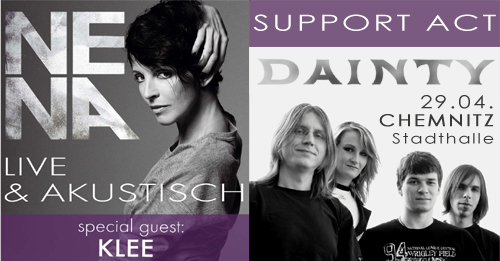 Special guests are KLEE - so it will be once again an eventful evening at the Stadthalle Chemnitz!